We’re located right in the heart of Maroochydore and happily extend out services to all surrounding areas. As just mentioned, Andrews High Tech is all about your convenience. We are always giving our clients a lift to the local shopping centres, picking up a client’s vehicle from their workplace, or dropping client’s home and picking them up later in the day. We also have a small fleet of courtesy vehicles if you need to keep moving while we care for your vehicle. We are all about doing whatever needs to be done to make your life easier. When considering who is going to care for your vehicle you should be asking one very important question – Who will be performing the work on my vehicle? You see most Dealerships and a lot of independent businesses employ Trades Assistants and Apprentices to perform a lot of the work in the pursuit of higher profit margins. At Andrews High Tech the only hands that will work on your vehicle are those of a fully trade qualified Automotive Technician. What’s more most of our staff are accredited with two automotive trade qualifications and currently working through their third. So when your vehicle is in our safe hands, you can be sure you are getting what you pay for. Andrews High Tech Automotive is really several business’s rolled into one. We have our European Vehicle division where we specialise in Audi, BMW, Mercedes and Volkswagen. Our Asia/Pacific division where we specialise in domestic, Japanese and Korean vehicles and our Performance division where the focus is on Performance Tuning for Petrol and Diesel powered vehicles. At Andrews High Tech Automotive we love what we do. Take a few minutes to explore our very informative website and you’ll soon realise, not only is Andrews High Tech a true one stop vehicle maintenance centre, but also the right people to care for your vehicle. Providing clients with an honest, personal and cost effective alternative to taking their vehicle to the dealer. The off-the-main-road position of the business ensures Andrews High Tech Automotive provides outstanding customer service as word of mouth recommendations have always been the driving force for the growth of this business. 1989 – Andrews High Tech Automotive was established in 1989. It began as a partnership with Andrew and Tess Napper the owner/operators of the business. 1993 – The business enjoyed steady growth and Andrew and Tess employed a mechanic to help with the increasing work load. 1997 – the small workshop was no longer big enough to cater for the client demand. The business relocated to a larger building and to this day is the current site of the business. The new workshop was fitted out with state of the art equipment and allowed for the expansion of the business as it was required. 2016 – 27 years on and Andrews High Tech Automotive has grown to arguably the largest independent repairer on the Sunshine Coast with Andrew and Tess still owning and operating the business. Sometimes things can and do go wrong, this is inevitable in service industry. But it is the lengths that Andrews High Tech Automotive will go to appease a client that really sets this business far away from all competitors. It is the peace of mind that every client of Andrews High Tech Automotive enjoys. For they know that if they have a concern with any aspect of the business, their cause will be heard calmly and action will be taken swiftly. 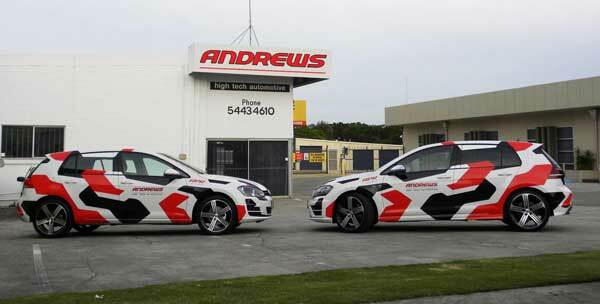 Andrews High Tech Automotive currently employs 14 staff in total. There are three service advisers that deal directly with all clients. A workshop foreman whom controls the work allocation to the technicians and attends to clients driving in with small motoring concerns. There are 9 technicians whom perform the servicing and repairs on vehicles. And a general hand that provides our clients with a pick up and delivery service. On going training for staff is essential so that our technicians can stay at the forefront of their profession. Our technicians attend regular training evenings on the Sunshine Coast. They travel to Brisbane or the Gold Coast on weekends and are even flown interstate to receive specialized training. Andrews High Tech Automotive today is about providing a premium service to clients with a minimum disruption to their busy daily schedual. We understand that most people these days are extremely time poor and not having their vehicle for a day is a major inconvenience. That is why we have included the offer of picking up client’s vehicles from their place of work or from home and delivering the vehicle back when the work is completed. As well as the convenience of pick up and delivery the business offers three loan vehicles, so clients that need too can keep on the move whilst their vehicle is being worked on. Andrews High Tech Automotive is much more than just a mechanical workshop to its clients. A lot of our clients take advantage of our driveway service. They call in once a month to have their tyre pressures checked and the under bonnet fluid levels checked, all at no charge. It only takes about 5 minutes and ensures their vehicle is in tip top shape. For many clients we are also a motoring advisory service. Parents bring along their children that are getting ready to purchase their first motor vehicle and talk with one of our service advisors as to which vehicle would best suit their child’s need and budget. We communicate with our clients and let them know when we think it may be time for them to consider moving onto another vehicle. If for example the cost of essential repairs exceeds the true value of the vehicle. When clients are considering buying a new or second hand vehicle they quite often talk with us first. We give our clients insights into whether the vehicle they are thinking of buying is troublesome, expensive to maintain, is good value for money or over priced. Andrew and Tess wish to extend an invitation to you, to become one of our valued clients and enjoy the many benefits of dealing with the quality, professional and friendly service centre that is Andrews High Tech Automotive. Learn more our team and our wide range of services by following the links or simply contact us directly to make an appointment.